With the rapid increase in the use and discussion of content marketing, it’s time to address how modern B2B companies can leverage content marketing to build awareness, traffic, and leads. How can you plan your content marketing initiatives? What types of content are most effective for B2B companies? And importantly, how can you actually measure the result of your content marketing? A Guide to Modern B2B Content Marketing from Modern Marketing Partners takes you through the content marketing process; including planning, implementation, and measurement. The guide also provides tips and best practices for three of the most popular types of B2B content: blogging, case studies, and white papers. 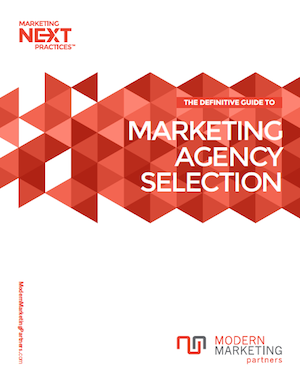 You can download “A Guide to Modern B2B Content Marketing” here. Please share this post with others who are interested in content marketing! Do you have any content marketing tips to share? Please let us know in the comment box below.